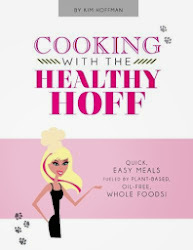 The Healthy Hoff: Garcon! Wine for my plants please. Watering my plants with wine? No, not really. I use water just like everyone else. I tend to get wine as a gift for hosting dinner parties. I don't actually drink wine because it doesn't agree with me. However, I feel bad about not using the wine, but love the look of the wine bottles, so I keep them around the kitchen as decoration. I also fill them with water in anticipation for watering day (once a week). I like to let tap water sit out at least over night if not longer, also known as aging the water (kinda fitting, eh?) because this allows for the chlorine to evaporate and chlorine is not good for plants. Additionally, I find the long narrow neck of the wine bottle very convenient for getting in between delicate stems and leaves. Lastly, the small opening of the bottle ensures that I don't drench my plants. So there you have it. Using wine bottles as watering cans gives a new life to something you'd normally throw away. It also adds decor to your kitchen and in my case is a great way to remember a kind gesture by a wonderful friend. WOW>>>..Its sooo hard to water planets with a big pitcher..thank u for that idea Hoff woman!...I love red wine..mmmMM >>I dont drink very often but A glass is good every now and again for me..Bravo!